Perfect product to keep in your glove compartment to clean up emergency bird bombs, sap, tar, etc. 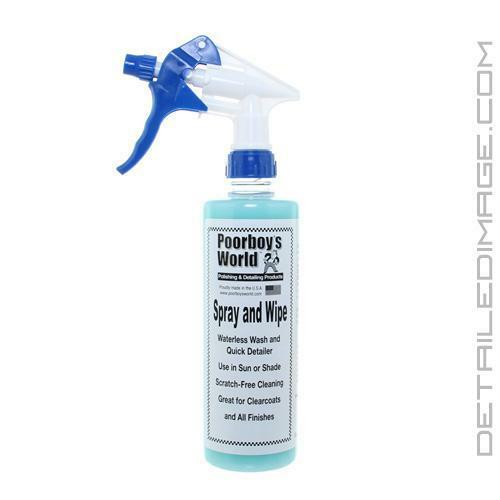 The Poorboy's World Spray and Wipe is a quick detailer that is very versatile. It's designed to separate contaminates and then encapsulate them in its lubricating formula so they can be safely removed from any surface. 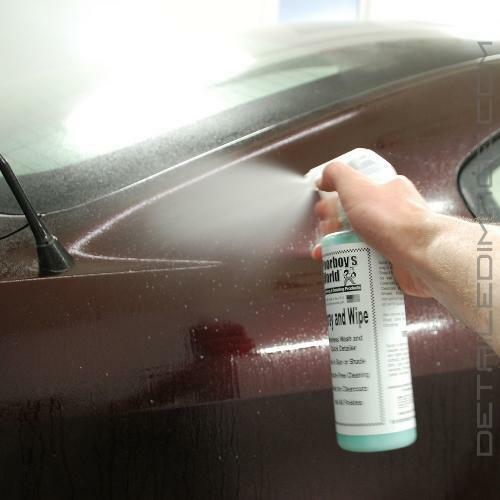 The Spray and Wipe's ability to encapsulate contaminates so they are not grinded in to the surface and possibly scratch the clear coat is what makes it an excellent product, especially for a waterless wash. If you don't want to wash a freshly detailed vehicle, with light surface contamination, than you can use the Spray and Wipe. Just spray a section of your vehicle and wipe it away with a clean microfiber towel and you'll have a clean surface with a great shine. The Spray and Wipe is an excellent clay lube for many of the same reasons it's a great waterless wash. When you glide a clay bar back and forth you lubricate the surface first with a product like the Poorboy's World Spray and Wipe. The Spray and Wipe reduces friction between the contaminates and the paint so they are not grinded in to the paint and instead are safely absorbed in to the clay bar or microfiber towel. Spray and Wipe is a quick detailer that can also be used to clean the interior, glass, bird droppings, bug smear, lubricate buffing pads and much more. Bird droppings and insect smear can etch into your clear coat in just minutes so keep a bottle of Spray and Wipe in your vehicle to clean up any unexpected messes. Pick up this versatile product and you'll be ready to take care of your vehicles detailing needs. Spray and Wipe is the easiest and simplest way to clean any vehicle with No Hose, No Soap and No Mess! Spray and Wipe contains no wax - No artificial shine. Safe for all Clearcoats and all Paints. Great to use on: Clearcoats and Paint, Glass, Chrome, Wheels, Polished Aluminum and all non-porous materials. Use as your car wash or just for quick clean-ups. Also removes...Dust, Dirt, Water Spots, Road Grime, Fresh Tar, Sap and Bird Droppings. Spray a small amount onto surface to be cleaned. USe a very soft cloth or preferable a micro-fiber cloth. Wipe very lightly back and forth. No circles...No rubbing...and turn cloth as it gets damp or dirty. Use clean cloths when doing windows. The less you use the easier and better the results. I love this stuff.. use it for so many different things and never lets me down! Worked better than I ever expected. Used it to clean a cousin's Honda CRV that is parked under oak trees and had not been washed in over a year. Dirt, tree sap, bird droppings, were all removed. The guys on the block were impressed with the results. I've got to say you guys have wonderful customer service. I'm going to tell all of my car enthusiasts friends about you.